« The Nap Mat…Not Just For Napping! 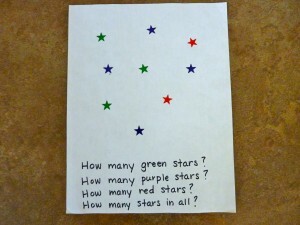 I wanted to work on the math concepts of “How many ___?” and “How many in all?” with Andrew. While my first preference is to use objects or manipulatives, I also realized that it would be helpful for him to be able to count things on paper. I wanted to see how he would do discriminating visually between objects, counting only the things he was asked to count and see if he’d miss any or double count some things. Counting pages which were then made into a book. Here he is at age 4 counting. The photograph above shows what the station looked like. 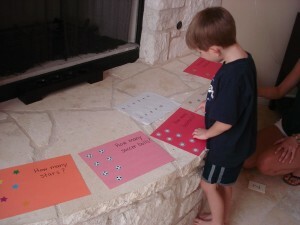 So easy to make yet helped him build his counting skills and helped me get a good idea of his counting skills. I simply took a sheet of paper and got out some stickers. I began with each page having just one kind of object for him to count. I also included a number sheet so he could point to the number. This was important because at that time he was not using any consonants so when he counted it sounded a lot like, “uh, uh, uh, uh, uh, uh, uh-uh, uh, un, uh.” While I could understand his intonations and inflections, as slight as they were, I wanted to make sure I wasn’t putting an answer on him by thinking I heard something I didn’t. We did it this way for a while and then when I felt like he got that, I added two different objects for him to count. I placed a few of one color star sticker randomly on the paper and then a few of some other colors. 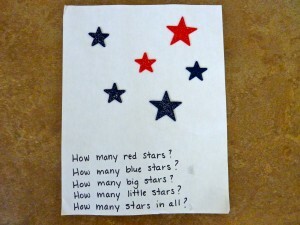 How many stars in all? I created several different pages using different stickers and different amounts. Some textured sparkly stickers used to create this page. I would recommend choosing stickers that are the same at first before moving on to stickers of like items. I put the pages together by placing the pages into sheet protectors and placing those in report covers. If you are using construction paper, you will have to cut the paper down a bit so it’ll fit in the protectors. These could also just be stapled together. He really enjoyed doing this activity and loved the fact that he could “read” the book on his own.